The Expanded Food & Nutrition Education Program (EFNEP) is a partnership of the University of California, the USDA, county governments, and California residents. This program is the main outreach and public service branch of UC’s Division of Agriculture and Natural Resources for low- income families and youth. EFNEP is administered by the county UC Cooperative Extension offices. 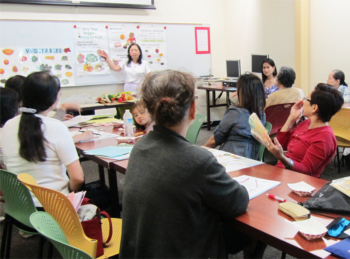 Trained nutrition educators deliver the educational program in our communities. Nutrition educators empower participants to adopt healthy lifestyle practices. The goals include providing information about food choices for healthy living and reduced risk for chronic diseases, safe food handling, storage and preparation, and making the most of resources to feed the family. For both adults and youth, the lessons are learner-centered with activities for practicing newly learned healthy living skills and physical activities. These goals are attained through a series of lessons conducted in small groups. Families have shared that their participation in EFNEP has transformed their lives for the better. They have changed what their family eats on a regular basis, switched to low-fat milk instead of whole milk and have fruit for snacks. They eat more vegetables and fruit and thaw meat and poultry in the refrigerator. Some walk daily, others play games with their children. Almost all use store ads and unit pricing to get the best shopping deals.